An Overview of the Mayan World with synthesis of the Olmec, Totonac Zapotec, Mixtec, Teotihuacan, Toltec and Aztec Civilizations. Merida, Yucatan, Mexico: Produccion Editorial Dante, S.A., 1985. 5th Edition in English Glossy Pictorial Wraps Very Good in Very Good Wraps 8vo (6-1/2 x 9), 280 pp with 81 pictures (B&W and Color Photographs, drawings, and charts) and 7 Maps. Book is NEAR FINE, a slight gap in gutter between cover and flyleaf, but pages are clean and tight and spine is strong. Glossy pictorial wraps are VERY GOOD. (h) An excellent study, comprehensive and detailed but not dull, answering questions about symbols, cultural events, geography, etc. 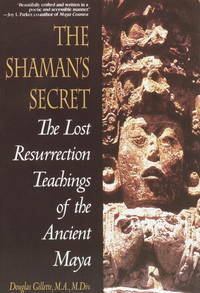 Shaman's Secret: The Lost Resurrection Teachings of the Ancient Maya. New York: Bantam, 1997. First Paperback Edition Glossy Pictorial Wraps NEW 8vo (6 x 9), 278 pp includes Index, Bibliography, Glossary, and Notes. Trade Paperback is NEW -- unmarked and Unread in FINE glossy pictorial wraps. (h) The Mayan perception of the universe was that it was created as an act of vision and that the same process characterized creations by artists who were, then, of necessity, shamans. A brilliant work. London: Thames and Hudson, 1965. First Edition, First Printing Cloth Near Fine in FINE DJ 8vo (6 x 8-1/4), 231 pp including Index, Bibliography, Notes on Text and Notes on Photos. Hardbound book is Unmarked and NEAR FINE -- pages fall open naturally to signature breaks but all pages are clean and tight. Glossy pictorial DJ is price-clipped but otherwise FINE. This was -- and still is -- the landmark book by Reichel-Dolmatoff, arguably the foremost pioneer of the cultural-historical anthropology of Colombia and the western Amazon. History, social organization, horticulture, artifacts and art, are all examined with insightful text plus 65 photographs, 66 line drawings, 2 maps and 2 tables. One of the excellent "Ancient Peoples and Places" series Edited by Glynn Daniel for Thames & Hudson. Flesh and Blood: A History of the Cannibal Complex. London: Hamish Hamilton, 1975. First Edition, First Printing Cloth AS NEW in AS NEW DJ 8vo (5-1/2 x 8-3/4) Clothbound book is FINE -- Unmarked and AS NEW, bound in rust-red cloth -- in FINE pictorial DJ AS NEW in a Bro-Dart cover. The only mark on the book is the number 6 stamped onthe bottom page block. Otherwise, AS NEW. (h) A brilliant study of the history of humans eating other humans, from hunger to ritual to werewolves and vampires to the criminally insane. This followed her acclaimed "Food in History." Ships from California, USA.